The Boston Red Sox are one win away from the World Series after an 8-6 victory over the Houston Astros in game four of the American League Championship Series (ALCS). Boston got production from up and down their lineup as Jackie Bradley Jr. once again belted a home run to give the Red Sox a much-needed boost in a key moment. Rick Porcello was not great, but he was good enough to keep the game tied and then the middle of the bullpen did the rest. Craig Kimbrel was shaky but he locked up the game with a two-inning save. He almost did not, though, as Andrew Benintendi had to make a game-saving diving catch with two outs and the bases loaded in the ninth inning to rob Alex Bregman of a hit. Championship teams do the little things right. They limit baserunners. They fight when they do not have the best stuff on the mound. They throw strikes when their team have a lead. The Red Sox have done that all series. The Astros have not. 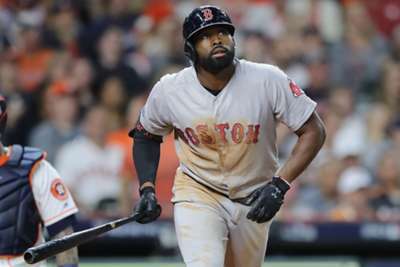 In game four, the Red Sox looked like the defending World Series champions while the Astros tossed multiple wild pitches, ran into an out at second base, took all five pitches in an at-bat – including a called third strike with runners on second and third with two outs in the seventh – and walked a man with the bases loaded. Meanwhile, Boston went five for 12 with runners in scoring position, tallied eight two-out RBIs, allowed just one run with their bullpen from the fifth through the seventh innings and went head-over-heels into a dugout trying to catch a foul ball. The Red Sox played like a championship team in what was a championship game on Wednesday. The Astros did not. The ALCS has been changed by the use of instant replay and not in a good way. In game three, Astros left fielder Tony Kemp made what looked to be an unbelievable catch on a fly ball off the bat of Steve Pearce, but upon further review, there is a distinct possibility the ball grazed the wall and was not actually a catch. However, because the call on the field was an out, the ruling was not changed. There was no explanation to fans watching the game. In game four, the ruling was even more impactful. On a fly ball off the bat of Jose Altuve in the first inning, fan interference was called on a ball that was up in the stands in short right field. A two-run homer was taken away. Upon further review, the argument can be made the fans never reached out onto the field, so they had a right to the ball. But the call on the field was interference and was not overturned. Again, no explanation was given. These calls, whether right or wrong, completely revealed the flaw in MLB's replay system. First, to offer no explanation in the stadium as to why a call is or is not overturned is not helpful for umpires or fans. Second, there may not be enough cameras on the field to confirm whether a ball hit close to the wall, is actually over it, or against it. MLB cannot appropriately review calls without the necessary tools. Baseball is a simple game. If a hitter cannot hit a pitch, keep throwing that pitch. If a pitcher cannot throw strikes, wait until he has thrown you one. However, while a hitter may have trouble with a pitch most of the time, they can have a lot more success with it when they know it is coming. The Astros got obsessed with a game plan and it cost them. Bradley does not hit finesse pitchers or the change up well. Bradley hit .205 this season against finesse guys and is a .170 hitter against the changeup in his career. Houston took advantage of that early in game four, starting him with breaking pitches early in the game and then changeups in his second at-bat. So Houston thought they would do the same thing to Bradley in his third time at the plate. What resulted was a changeup from Josh James to Bradley on the first pitch. He did not miss it, taking it out to right field for his second home run and eighth and ninth RBIs of the series. JBJ has done it AGAIN.